The end of the Cold War and the bipolar era constituted a significant change in Germany's and Japan's foreign policy settings, granting both countries greater leeway to pursue policies divergent from Washington's strategy. This important book fills a gap in the existing literature by employing an explicitly comparative framework for analyzing and evaluating Germany's and Japan's post-Cold War regional foreign policy trajectories. Recent non-comparative studies diverge in their assessments of the extent to which the two countries' foreign policies are characterized by continuity or change, as while the majority of analyses on Germany find overall continuity in policies and guiding principles, prominent works on Japan see the country undergoing drastic change. Through a qualitative content analysis of key foreign policy speeches, this book traces and compares German and Japanese national role conceptions by identifying policymakers' perceived duties and responsibilities of their country in international politics. Further, through two case studies on missile defence policies and textbook disputes this study investigates actual foreign policy behaviour in order to question the assertion that post Cold War Germany and Japan are following very different paths. Providing a much needed new analysis of German and Japanese foreign policies, this book will be of great use to students and scholars interested in Japanese politics, German politics, comparative politics and international relations more generally. 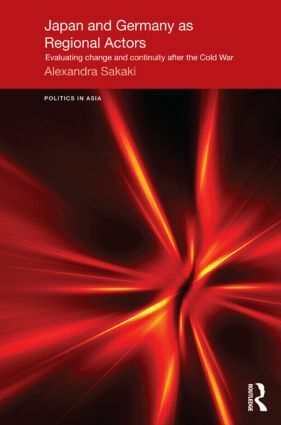 Alexandra Sakaki is a Bosch Foundation research fellow at the German Institute for International and Security Affairs (Stiftung Wissenschaft und Politik) in Berlin, Germany.